I am a United States Citizen that has served my country with honor (5 medals and many more citations). I have lost everything (my family, my retirement, my freedom... etc) because a judge in the state of Colorado and Adult Protective services intervened and saw a way to prosper off my misfortune. They were never given the documents from the VA that clearly stated I was competent. My sister has contacted everyone she knows to get my issue recognized on my behalf and has struggled to find a way to get media attention, government intervention, etc. I have resigned my self that I will not see my children for the holidays due to the restrictions placed on me by the court, my conservator and guardian appointed by Judge Fasing in Arapahoe county. I have not committed any crimes.I don't drink or do drugs. I am educated with a Bachelor of Science in Project management from the University o f Maryland and a Masters Degree in Systems Engineering from George Washington University. I owe no one money.I am retired military Lt. 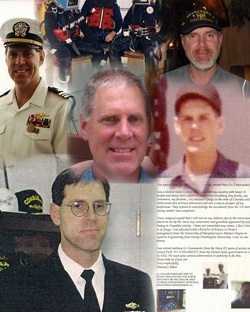 Commander from the Navy (22 years of service) and retired DUE TO A DISABILITY from the United states government as a (G-S15). We need some serious intervention or publicity to fix this.Please help us if you can. Carol Fox (his sister) in Illinois. 708-404-8447 . Email is turtlecf@yahoo.com. Retirement receiving his window of medals. Needing you in my life. My hero. Younger but bigger, stronger and kind. Our gentle giant. My brother. To protect our God given right to freedom. Even they get to take time for family and friends. You saved many in war. You came home to serve even longer. Leaders how to lead. You were a hero. For all you earned, freedom and care you now deserve. Prisoner in a greedy mine field called justice. As if no one notices, as if mindless judges have more power than God. But for now, that brings you no closer to home. Alive, during your living years. You still have those same twinkling eyes and sideway grin. They have stolen everything else. But your heart and goodness. Planes flew you for days to be with your mother as she was dying. If your family wants to come to love you, or you go to them. No one seems to believe us, care enough to make this right. Life isn’t fair. Colorado has stolen you. I will fight forever to bring you home. ﻿ “I just want to be free,”﻿ Baker said. “If I was in jail or if I did something wrong, I’d understand. But I didn’t do anything wrong.” He is being held prisoner by Protective Services in Arapahoe County in Colorado. He has been denied family, friends and freedom, his life savings pillaged and his future in the hands of those who don’t know who he is, just how much he was worth, in money. But to his family fighting for him to go home and retire in peace, his worth is measured with love. Edward J. Baker, Lt. Commander., USN, retired, 22 years, and a Master Diver is 55 years old. The second oldest of five siblings, he joined the Navy when he was 17, while he was a senior in High School in a south suburb of Chicago. He retired from the Navy, and then worked as an engineer at Lockheed Martin; then 7 years working for agency in the government, briefing Congress and Presidents on covert operations. He has stood in the halls of the White House and the Pentagon, receiving numerous medals, citations, plaques and letters signed by Naval Elite and Presidents. He worked on missions and risked his life almost dying himself being crushed by a ship for the sake of saving his men. Offered retirement at that time, he chose to return as Administration. He earned his Bachelor and Masters Degrees while serving our country. He has a grown daughter and young son and at 6’5”, stands heads above most, in fact and in honor. After exorbitant costs going unexplained to concerned family members, they decided, without provocation, that he was not competent 4 weeks into the program. Without any evidence of being incompetent, he was taken into state custody without notification to his family or the VA. They took papers to court and had him “ordered” incompetent. He never signed any papers. They have never produced any signed papers. He was not told what would happen at court. Family was not there, nor informed and he had no legal representation. And his rights were gone. Just gone. He was removed from the rehabilitation program and placed in a nursing home of dying elders that were neglected. He was prohibited from family communications and visits. His guardian misrepresented herself, using his social security number to gain access to the VA doctors to try to influence them to sign papers to further limit his life and was escorted from the facility. She insisted on continuing a medication that was a sedative long after the doctors had stopped the order. They never inquired into family to know that I, his sister, or one of the brothers even existed. They were after his money and instead, stole his life. In December, 2010, Edward’s daughter arranged an interview, at an assisted living home near the VA hospital, family and Navy friends. The guardian disrupted the interview and insisted Edward leave immediately and go back to Colorado. He wanted to finish the visit with his daughter and went to the police department for protection. The conservator, called a judge she knew and got a writ to have him removed based on his daughter being a “danger” to him. On their return, they moved him into another living facility. He has been denied any voice in this situation from the beginning. No one will let him speak because he can tell his story, and upon meeting him, doctors, lawyers, VA representatives, workers from where he has lived can tell you that he is not incompetent. He has been denied legal representation of any kind since July, 2012. One judge recused himself from the case after being exposed for being involved in similar situations. The next judge would not even acknowledge Edward in the court room with the proof and papers in front of him stating that Edward was COMPETENT by the doctors who have treated him. In the three years after his stroke, doctor visits, and rehabilitation, his competence was never questioned. The stroke was in 2007, and he came to Colorado in 2009, living a normal free life until June of 2010. There is certification and documentation stating he is competent by doctors and neurologists from 2007. He never had to have this verification before because he never needed it to prove anything to anyone. These court appointees have written numerous letters to the VA trying to get this changed to get his federal funds that the VA had already said he was competent to handle. His assigned GAL (Guardian ad litem), guardian and former conservator have sat on the opposite side of the courtroom opposing any decent proposal to return him to his retirement and the safety and protection of his family. They paid themselves for opposing him with his own money for denying him his rights. Powers of attorney for health and finances were in place. In court, they became null and void. He was denied attending his own divorce, family funerals and weddings. This group of County Attorney, GAL lawyer, guardian, conservator and judges are now $800,000 + richer with a guarantee of $10,000 a month and a disability settlement. They wrote how they planned to spend him down to be put on Medicaid. He was set for life until his assets were stolen from him. These employees of the State of Colorado are working together bound by marriage, business connections, settlements, investments and employments. Conflict of interest is an understatement. Since December,2010, he has been moved 4 times, all his furniture and many belongings being given away while other belongings have been held "hostage" as means of manipulating him and his family. Heirlooms worth more than just many dollars denied going to sons, brothers and grandsons. As a result of this loss, harassment and denial of family, he had a bout of depression and asked to go to the VA for assistance in November, 2011. While in the hospital, his guardian emptied his apartment into a storage unit, terminated his living arrangement, sent assistants to confiscate his mail and tried to put down his dog. Edward was in the VA until Jan 10, 2012, being protected at the request of his family to keep him there as long as possible so he could be safe from the abuse and threats from these women employed by the state of Colorado who had spent a year and a half confining, limiting, degrading and reducing him to no more than a homeless veteran. When Ed left the VA, he had no home or belongings. His daughter was able to convince the guardian to send his dog to her. They moved him into The Sierra Nursing Home, a skilled nursing facility. The doctors and social worker disagreed with this choice of residence, but it was the only one the guardian would accept. The guardian had him placed in locked isolation for over 90 days, while no doctor ever said he ever needed to be locked in, anywhere. We could get his dog, but we still cannot get Edward home. Anyone who tries to get involved has been threatened with contempt, loss of job, loss of appointment, loss of their freedom because they are not an “interested party.” His family is very familiar with the illegal corruption of the Colorado courts. Pages of public records tied to families losing millions of dollars; manipulations of taking property from those trying to save their families from the blatant abuses; and their contributions to the deaths of the elderly by indifference for their quality of care, as well as the loss of jobs, homes, investments and reputations of those who survive them. This is not just a fight about competency. This is a fight about collusion and abuse. Abuse of a system meant to protect people from being abused that, instead, is protecting these monsters. They are the ones having the authority and power to destroy families and futures without fear of retribution, because they are the ones being protected. Scam… the County Attorney assistant files unnecessary petitions to appoint Guardians and Conservators, inserts the lawyer who obstructs evidence of capacity or family members who are willing and able to care for the Respondent and together they limit the appointments to her friends…the conservator and guardian. There is only one Judge who handles probate matters and so rubber stamps it all. The facts and law are irrelevant in most every order he issues. There have been numerous requests for the appointment of a Special Prosecutor to investigate. There are offices of Federal and State regulations promising to look into verified offenses by these people and this organization who said they would help Edward, and by not getting involved to correct this, are in fact moving him faster towards his death than any stroke could do. Susan Adamczyk, the director of Human Services stated to me, “If you don’t have the money to find a lawyer who can get this in front of a judge, then you will just have to live with these decisions". I am never giving up on bringing Ed home to those who love him. Ed continues to believe that right justice will prevail. His hope and humor are more heroic than anything he did to receive a medal. I sleep knowing God sees. 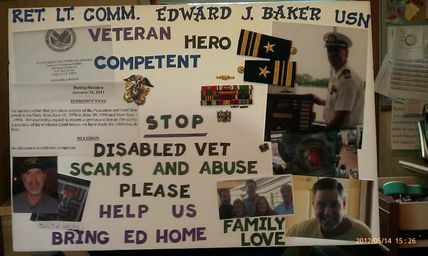 In November of 2007, Edward Baker, Lt. Commander,USN, retired, Master Diver with 22 years of service, had a massive aortic stroke. This affected his left side, arm and leg strength, and some speech at first, confusion, memory loss. Most people don’t survive this but many can understand this, as it is exactly what happened to Senator Mark Kirk, who has since made a very public and impressive working recovery. Edward’s doctors called his recovery "remarkable". Edward is 55 years old. He retired from the Navy, and then worked as an engineer at Lockheed Martin; then 7 years working for agency in the government, briefing Congress and Presidents on covert operations. He has stood in the halls of the White House and the Pentagon, receiving numerous medals, citations, plaques and letters signed by Naval Elite and Presidents. He worked on missions and risked his life almost dying himself being crushed by a ship for the sake of saving two of his men, and then spent months recovering. Offered retirement at that time, he chose to return as Administration. He earned his Bachelor and Masters Degrees while serving our country. He has a grown daughter and young son and at 6’5”, stands heads above most, in fact and in honor. And now he is being held prisoner by Protective Services in Arapahoe County in Colorado. This will be the third holiday he has been denied family, friends and freedom. After his stroke, and up until July, 2010, he traveled enjoying his retirement. In 2009, Ed moved to Denver, Colorado, and along with the VA services and doctors, engaged Spalding Rehabilitation in 2010, to assist him in furthering his independent living skills. He signed a contract with Spalding Rehabilitation, guaranteeing him to be able to live independently and setting a guaranteed graduation date of July 2, 2010. He was moved into an apartment with CNA’s for 24 hour a day care he did not need. They took his belongings and tried to make him give them money. The cost of Spalding became exorbitant, and concerned family members questioned the costs and methods. So Spalding decided, after 4 weeks into the program, that he was now incompetent and not qualified for their program and called Protective Services, not family, not the VA. There were no doctors that ever confirmed that then or since. Without any evidence of being incompetent, he was taken into state custody without notification to all of his family or the VA. He was removed from the apartment and placed in a nursing home of badly neglected elders. He was prohibited from family communications and visits. His guardian misrepresented herself, using his social security number to gain access to the VA doctors to try to influence them to sign papers to further limit his life and was escorted from the facility. She insisted on continuing a medication that was a sedative long after the doctors had stopped the order. They never inquired into family to know that I, his sister, or one of the brothers even existed. They were after his money and instead, stole his life and keep trying to break his soul. In December, 2010, Edward’s daughter arranged an interview in Napa Valley, at an assisted living home near the VA hospital, family and navy friends. His guardian helped her with the guidelines. His conservator bought him a plane ticket. The guardian followed Edward to California, with his lawyer ad litem. They agreed to let him interview and move there. Edward wanted to finish the visit with his daughter, and stay in California as he had been told. The guardian insisted Edward leave California immediately and go back to Colorado. His host went to the police for protection from the guardian. The police would not listen to the ridiculous claims of the Guardian that he had been or was being kidnapped, as his host worked for the Police Department and they were already aware of the situation. The conservator, called a judge she knew and got a writ to have him removed based on his daughter being a “danger” to him. This was humiliating for him and upsetting to the hosts and daughter. On their return to Colorado, they moved him into a different living facility and threatened to send him further from Denver. His doctors had given him his medical records and supplied medications for his move and were surprised when he came to an appointment, thinking that he had moved to California as his guardian had told them. He returned to even more isolation from his family. He has been denied any voice in this situation from the beginning. No one will let him speak because he can tell this story and upon meeting him, doctors, lawyers, VA representatives, workers from where he has lived can tell you that he is not, not incompetent. He has been denied legal representation of any kind since July; 2012.They denied him his choice of lawyer. One judge recused himself from the case and was also recused by a higher judge, and the next judge would not even acknowledge him in the court room with the proof and papers in front of him stating that Edward was COMPETENT by the doctors who have treated him. He, also, is no longer involved in this case. In the three years after his stroke, doctor visits, and rehabilitation, his competence was never questioned. There is certification and documentation stating he is competent by doctors and neurologists from 2007, to December, 2011. His assigned GAL (Guardian ad litem), guardian and conservator sit on the opposite side of the courtroom opposing any decent proposal to return him to his retirement and the safety and protection of his family. On the opposite side of the courtroom is where they sit – in opposition to him. They pay themselves for opposing him with his own money for denying him his rights. Powers of attorney for health and finances were in place. In court, they became null and void. He was denied attending his own divorce in Virginia. This group of County Attorney, GAL lawyer, guardian, conservator and judges are now $700,000 + richer with a guarantee of $9,000 a month and a disability settlement. They have put him on Medicaid saying he has no money, in a state run home claiming again he has no money. He is to receive 2 retirement checks every month. His ex-wife gets a check. He gets nothing. Absolutely nothing. They claim $1700 a month for medicines supplied almost totally free from the VA. He was set for life until his assets were stolen from him. These employees of the State of Colorado are working together bound by marriage, business connections, settlements, investments and employments. Conflict of interest is an understatement. AND NO ONE... will look, read, acknowledge or challenge what has been done to this man and right this injustice. The VA apologizes for lack of knowing what to do. The White House will not respond to letters, emails or faxes regarding this. Every agency or government representative contacted has either claimed it is not within their capabilities or outside their jurisdiction to assist him. He has been moved 4 times, all his furniture and many belongings being given away while other belongings have been held "hostage" as means of manipulating him and his family. Heirlooms worth more than just many dollars denied going to sons, brothers and grandsons. As a result of all this loss and denial, he has had bouts of depression and asked to go to the VA for assistance in November of 2011, when the guardian and assigned GAL lawyer kept coming to his private room to continually harass him regarding any monies he had not given them. While in the hospital, his guardian emptied his apartment into a storage unit, terminated his living arrangement, sent assistants to confiscate his mail and tried to put down his dog. When Ed left the VA, he had no home or belongings. His daughter was able to convince the guardian to send his dog to her in Napa, California. We could get his dog, but we still cannot get Edward home. 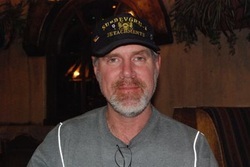 Edward was in the VA in Denver, until Jan 10, 2012, being protected at the request of his family to keep him there as long as possible so he could be safe from the abuse and threats from women employed by the state of Colorado who had spent a year and a half confining, limiting, degrading and reducing him to no more than a homeless veteran. They moved him into a skilled nursing facility. The doctors and social worker disagreed with this choice of residence, but it was the only one the guardian would accept. The guardian had him placed in locked isolation for over 90 days, while no doctor ever said he ever needed to be locked in, anywhere. This man lives an honorable life of never being arrested or confined until he retired and came to Colorado for recovery. He has been threatened with arrest if he leaves the state. We have numerous letters, actual documentation on Ed’s capacity and being deemed competent. He never had to have this verification before because he never needed it to prove anything to anyone. Anyone who tries to get involved has been threatened with contempt, loss of job, loss of appointment, loss of their freedom because they are not an “interested party.” If they were willing to help, they were considered NOT an “interested party”. His family is all over the country, but we are very familiar with the illegal corruption of the Colorado courts and the insipid collaboration of entities that shouldn’t even know each other’s names. They are in bed with each other. Literally and figuratively. Wives of judges and husbands of attorneys, conservators with pages of records tied to families losing millions of dollars; lawyers hiring friends as guardians. There are records of their manipulations taking property from those trying to save their families from the blatant abuses; and their contributions to the deaths of the elderly by indifference for their quality of care, as well as the loss of jobs, homes, investments and reputations of those who survive them. I was told if I did anything to oppose these women in their attempt to deny him freedom, I, too, would be held in contempt. This is not just a fight about competency. This is a fight about collusion and abuse. Abuse of a system meant to protect people from being abused that, instead, are protecting these monsters. Millions of dollars as the prize for preying upon those who they hope have no family to save them. They are the ones having the authority and power to destroy families and futures without fear of retribution, because they are the ones being protected. My family is fighting for our brother, Edward, because no one else will. All the agencies, politicians and lawyers I have written, faxed and called all agree - it’s wrong, it’s illegal and mostly, it’s unethical, but they won’t touch it, because they are afraid of the county court involvement in Colorado. Their Governor knows. Their Senators know. Their Attorney General knows. Every member of the Committee of Veteran’s Affairs knows. So as you sit reading this, you are now aware of one of the most despicable crimes against disabled veterans in the United States. There are others who are older than my brother, who for years have sat, and are waiting to die in nursing homes in the Denver area, right now, without ever learning the whereabouts of their spouses taken to other homes, and no assets left to share or care for themselves. Some of them are hoping to tell their stories, too. Families still search for justice even after their loved ones have passed, and the courts compound their grief with further litigation to take whatever is left of any estate with no reason other than they can and no one will stop them. This “gang” in Colorado misjudged Edward’s family’s quietness for indifference, and they were very, very wrong. Most people who get taken by this have no family outside of them and are easy targets. We are not going to stop. What country should we take him to so he can have the RIGHTFUL freedom he fought for these women and men to have??? Susan Adamczyk, the director of Human Services stated to me, “If you don’t have the money to find a lawyer who can get this in front of a judge, then you will just have to live with his decisions". Currently, Edward has been moved to an assisted living home in Arvada, Colorado (the fourth move). I went there to assist him in getting settled and saw the damaged plaques, awards, pictures, Naval uniforms, etc. which is about all he has to call his own. The beautiful leather chair he had received from the agency as a retirement gift given away as trash when it was such an important treasure. He was trying to arrange a visit to family for this holiday. His guardian said it could be arranged if family gave him the money. Once he told her he could get the money, she denied him any holiday visits with family. Edward’s family is being assisted by Peter Harris, Esq., of the law firm of Solem, Mack & Steinhoff. In spite of the fact that our family is not able to pay legal fees at this time, Peter has continued his support and tried repeatedly to represent Edward, but is denied by the court that will still not allow him any legal representation to protect his rights and defend his desire to go home to his family, and those who love him. Mr. Harris continues to represent Edward’s grown daughter as she strives to become his Guardian; trying to free him to return to Napa, California, and the retirement he so deserves. The fight continues. We are never giving up. I am never giving up. Ed continues to believe that right justice will prevail. His hope and humor are more heroic than anything he did to receive a medal. I sleep knowing God sees. Four families with cases in Arapahoe County's probate court say that two attorneys involved in their estates should have disclosed a real estate investment they made together before charging the estates at least $400,000 in fees. Colorado's disclosure requirements for attorneys generally do not extend to family members of clients, experts said. But the attorneys' joint investment concerned the district's chief judge enough that he issued an order in April that they could not be involved in the same estate cases without court approval. Last week, the judge ordered one of the attorneys, court-appointed public administrator Tamra Palmer, to advise him of any cases since April in which she has participated with lawyer Jennifer Gormley. Palmer responded that there are four such cases but that she was appointed to each before the judge's April order. Cliff Battista, who was trustee of his father's estate, said Palmer testified to have him removed, then, on Gormley's recommendation, took his place as a court-appointed trustee. Both lawyers then billed the estate for their work on the case. "I'm appalled that people have the audacity to do that to someone else," he said. Colorado's rules of professional conduct for lawyers forbid representing a client if that creates a conflict of interest. But the terms defining a conflict leave room for interpretation. For example, a conflict exists if "there is a significant risk" that representation of one or more clients "will be materially limited" by, among other things, "a personal interest of the lawyer." In many cases, the rules "are very difficult," said Jamie Sud-ler, the office's chief deputy. "What you're analyzing is what's in the lawyer's head." A shared business interest doesn't necessarily create a conflict, he said, and disclosure requirements to clients generally do not extend to family members. Asked about a situation where one lawyer is recommending the other for court appointments or approving the other's bills and they have made an investment together, "that's a twist," Sudler said. "That might make a difference" as to whether a conflict exists. Palmer responded in an e-mail to questions from The Denver Post. "When I am appointed as a fiduciary, I perform my duties in a neutral and unbiased manner and in accordance with the laws of the state of Colorado," she said. "I am unable to respond to the perceptions of parties connected to those cases." "Because of the law and rules of confidentiality in probate matters, I am restricted from commenting or answering your questions concerning specific probate cases," Gormley wrote in an e-mail. She noted that the court is aware of her business relationship with Palmer. "Our ownership in the building is a matter of public record and is not a secret," she said. The investment, however, prompted the April order by Arapahoe district court's chief judge, William Sylvester. And after inquiries by The Post, Sylvester and Timothy Fasing, the district's probate judge, took additional action. On Jan. 16, Judge Fasing noted in Palmer's records "entries reflecting payments to attorney Jennifer Gormley" since April, and he ordered Palmer to explain how that conformed with Sylvester's order. The next day, Sylvester issued an order telling Palmer to advise him of any cases since April "that she has dually participated in with attorneys Jennifer Gormley and/or Cheryl Miller," the third investor in their building. Palmer responded in writing on Friday that she and Gormley have participated in four cases since Sylvester's April order, but that her appointment to those cases occurred prior to the order. "It is my understanding that those cases do not require a stipulation or additional court order," she said. Palmer did not receive a copy of the April order until last week, she said, but she had met with Sylvester in April to discuss her business relationships. "I was not in any way attempting to avoid or circumvent the order. I just wasn't aware of it," Palmer said. Cliff Battista says his parents, Nick and Rose, led modest lives to save money for their four children. They clipped newspaper coupons. They overlooked the fraying carpet in their Littleton home. They kept mismatched sets of glasses in the cupboards. After Rose died, though, Nick grew unhappy with his eldest son, Carl, and disinherited him. When Carl and his sister Cindy Long angrily confronted their father, he disinherited Cindy, too, according to Cliff Battista and his lawyers. Cindy Long hired Gormley to reclaim her share of the estate. The lawsuit split the family and led to costly litigation. In court, Gormley alleged that Nick "suffered from an insane delusion" when he created and amended the family trust and that Cliff Battista had unduly influenced him. Gormley called Palmer as an expert witness, who testified that Cliff Battista had misspent trust funds. Upon Gormley's recommendation, the judge removed Cliff Battista as the trust administrator and replaced him with Palmer as trustee of a $732,187 estate. Stanton Rosenbaum, an estate lawyer in Denver, questioned that arrangement. "That doesn't pass the smell test. I'm surprised the judge allowed that," he said. "You've got a potential conflict right there." Not until last April, when Palmer was required to answer questions in court, did the family get a detailed account of her business relationship with Gormley. By then, much of Nick Battista's savings had been spent on the legal battle. Cliff Battista provided documents showing Palmer collected more than $50,000 in fees from the estate in three years. Cindy Long, who now regrets hiring Gormley, said her attorney and an associate amassed more than $200,000 in fees, then reduced them as part of a settlement. She is uncertain of her exact payment, but "the pressure of the attorneys' fees was tremendous," she said. "It took a toll." "They don't tell people they have this relationship," said Tina Spencer, the Battistas' other daughter. "People get caught off guard. Once they get a foot in the door, you can't get rid of them." At the April hearing concerning the attorneys' joint investment, Palmer denied she had a conflict of interest or an obligation to disclose her investment with Gormley. "No," she replied when asked by an attorney for family members about a potential conflict. "I have a job as a fiduciary to do my job as a fiduciary." Palmer has served as Arapahoe County's public administrator for 12 years, a court appointment to distribute the assets of a deceased person who did not designate anyone to do so in his will. She also gets appointed by Judge Fasing as a conservator managing estates of people deemed incapable of handling their own money. In Colorado, the court administrator's office oversees the district courts. Carol Haller, its legal counsel, said Judge Sylvester sought her advice before issuing his April order. In general, when attorneys are appointed by a court, "we expect them to act with due regard that they are an arm of the court," she said. "We expect them to avoid improprieties and even the appearance of impropriety." Palmer's appointments often follow recommendations from the Arapahoe County Department of Human Services, which petitions for guardians and conservators for disabled people, and from Virginia Horton, the assistant county attorney representing the department. Gormley has entered probate cases as a plaintiff's attorney, a guardian's attorney and the attorney for a ward of the court. Their joint investment dates to July 30, 2010, when a company called Urit LLC bought the 12,882-square-foot ranch-style building at 6060 S. Greenwood Plaza Blvd. for $1.427 million. Urit had borrowed $1.539 million the previous day to facilitate the purchase. State records list Gormley as the registered agent of Urit LLC. In her court testimony, Palmer said she, Gormley and Miller each own one-third of the building. Edward J. Baker enlisted in the Navy right out of high school in Illinois and retired as a lieutenant commander and master scuba diver with dozens of medals and commendations for his service, which included classified missions. In 2007, he suffered a stroke and two years later went to live with a sister in Colorado while getting rehabilitation treatment. In 2010, the county human services department successfully petitioned the probate court to make him a ward of the court. The rehabilitation center chose Gormley as Baker's attorney, and Palmer was appointed conservator of his assets, according to Carol Fox, Baker's sister in Illinois. Fox said when Baker visited his daughter in California, his court-appointed protectors — including Gormley, Palmer and a guardian — obtained an emergency court order forcing him back to Colorado. Repeatedly, "they spent his money to oppose him in court," she said. Baker, 55, now lives in a single room in an assisted-living house. He said he was told after a recent court hearing that he will be allowed to move to California after all. "They got a group there, and they just keep it within the group," he said of Arapahoe County's probate court. He attributes his loss of freedom to partial paralysis from his stroke, which he said no longer affects his mental capabilities. Baker tried to have Gormley replaced as his lawyer. But Horton, the assistant county attorney, and Baker's court-appointed guardian objected, saying he was incompetent to choose a new lawyer. "Ed misses his family terribly," said Fox, who calls him every day. "It's so sad." In court hearings, she said, "nobody would let him speak." Palmer's expense reports, which she submits to the court for approval, show that in two years, she received $58,927 and Gormley received $79,870 from Baker's estate. Those fees, as well as payments to other lawyers, Baker's guardian and the facilities where he was kept, exhausted nearly all of a $637,640 estate from 2010 to 2012. In her reports, Palmer attributed many expenses to extensive litigation with Baker's sister in Colorado. Eleanor Lewis held an estate valued at nearly $2 million when, at the age of 82, she began to show signs of dementia. Family members and friends worried she had become vulnerable to financial scams. She was living with a grandson in her home of 50 years, and other family members offered to help care for her. But the county human services department proposed a professional guardian and conservator. A court-appointed lawyer agreed. Valerie Crider became Lewis' guardian. Palmer, who had started helping one of Lewis' sons manage her money, took over as conservator. Two of Lewis' other children said that when they objected to their mother's care, alleging she was being drugged unnecessarily, Crider restricted their ability to visit their mother in their childhood home. Crider also required a supervisor to be present during visits, raising the costs of care, they said, and hired Gormley to defend her guardianship work. Crider said she could not discuss the case because it is confidential. Lewis' remaining assets include a ranch in Elbert County bought by her husband, who died before he could retire there. Janet Van Vliet, one of Lewis' daughters, provided a spreadsheet of expenses derived from Palmer's interim accounting reports from 2009 until early 2013, along with the reports. Those showed Palmer had received $36,000 in fees, while more than $210,000 was spent on guardianship services and reimbursements. About $41,000 of the guardianship charges went to Gormley in one year. In all, the costs charged to the Lewis estate, which also included 24-hour care and ranch maintenance, totaled $1.3 million. Van Vliet said Palmer recently notified the family that the ranch will be sold to pay for their mother's continued care. "It was just shocking every time we would get a report," she said. Chester "Skip" Morgan represented three of Lewis' children fighting the restrictions on their ability to visit their mother. "It was troubling" to learn that Palmer and Gormley had a joint real estate investment, he said. Gormley and Horton "presented a united front," he said, "on behalf of Valerie Crider and Tamra Palmer, who involved herself in the visitation issue and litigated, even though she was the conservator." Horton also said she could not discuss individual cases. In general, she said, Palmer is one of several people nominated as conservators because she is experienced and charges a modest hourly rate. "I have never nominated Jennifer Gormley to serve as a fiduciary," she said, "(and) neither Ms. Gormley nor Ms. Palmer is a personal friend." "The more conflicted, the more pleadings, the more the fees of the professionals increase," Horton said. McKean said family members can abuse or harm at-risk adults, although she was not speaking about the Lewis case. "Relatives can be toxic," she said. Parr, who still lives on the land and owns a recreational-vehicle storage business there, said his inheritance dwindled quickly after he complained about a guardian's treatment of his mother, and the guardian hired Gormley. The conflict climaxed when he withheld payments to the facility she lived in, alleging improper care. Gormley petitioned the court for an emergency order, saying Parr's mother was about to be evicted. In 2011, "Gormley suggested to Judge Fasing to relieve me as trustee of the estate and to appoint Tamra (Palmer) in my place," Parr said, and Fasing did. With court approval, Palmer sold family land along Union Avenue in Englewood to a competing business, landlocking Parr's site, he said. The new owner found that a water line crossed his land to Parr's house and shut the water off on Thanksgiving Day. "We are living on water we store in 5-gallon buckets that we get from our neighbors," he said. Parr appealed unsuccessfully to Fasing to have Palmer removed as conservator and trustee of his mother's estate. On Jan. 16, Gormley petitioned the court for payment of $203,260 in fees and costs accumulated by Emma Parr's guardian and Gormley's office. The court has not yet acted on the petition. Public administrators: Are court appointees who may be asked to distribute a deceased person's estate as its personal representative when no will exists, when no family member is willing and available to serve as executor, or when a will is contested. A public administrator also may be appointed to manage a ward's financial affairs. The order from Judge William Sylvester, dated Thursday, discharged Tamra Palmer "effective immediately" without explaining why. But it came after two previous orders from the judge concerning her business relationship with another lawyer and a story in The Denver Post detailing that relationship. Public administrators are appointed in probate court cases where no heir is named or willing to distribute the assets of an estate. They also may be called as conservators of estates when people are judged incompetent to handle their own finances.In 2012, Palmer reported charging with the court's approval a total of $319,851 in fees and costs for managing 87 estates.One of the heirs welcomed Judge Sylvester's decision Friday. "That's rather pleasant news," said Robert Lewis, one of Eleanor Lewis' four children. He and his sister, Janet Van Vliet, said much of their mother's $2 million estate was depleted in four years for 24-hour care, guardianship services, legal fees and other costs. Palmer was the conservator of Eleanor Lewis' estate, and Gormley was paid about $41,000 in legal fees after the guardian hired her. "The only thing that's left is the family ranch we're trying to keep," Lewis said. In April, Judge Sylvester issued an order that Palmer and Gormley could not be involved in the same estate cases without court approval. Last month, he asked Palmer to advise him of any cases where she and Gormley continued to collect fees. Palmer responded that there were four, but she had been appointed to each before the judge's April order. Judge Sylvester appointed probate lawyer Marco Chayet to succeed Palmer and instructed her to cooperate with him "to ensure a smooth transition." The Americans with Disabilities Act (ADA), passed more than two decades ago, has greatly improved the quality of life, not only for the more than 50 million people with disabilities here in the United States, but also for the one billion more who are living around the world. The ADA is the gold standard for the treatment of people with disabilities, serves as a model for other nations, and is the inspiration behind the creation of an international treaty that prohibits discrimination against people with disabilities worldwide. As President Obama recently said, "Disability rights aren't just civil rights to be enforced here at home; they're universal rights to be recognized and promoted around the world." We are reminded today, International Day of Persons with Disabilities, that the United States Senate has the opportunity to ratify the Disability Treaty and cement America’s leadership in global disability rights. The vast majority of us know someone with a disability, and people with disabilities are a critical part of our diverse society. They are our family, friends, neighbors, and colleagues. Over five million are veterans, over seven million are children, and over thirteen million are older adults. Thanks to U.S. laws and policies, these Americans all have the right to fully participate in their communities, and they are protected from discrimination—but only when they are within the United States’ borders. By ratifying the Disabilities Treaty, we demonstrate that these protections and standards must extend beyond our shores. Ratification would help promote accessibility standards internationally, as well as facilitate collaboration, innovation and idea-sharing. This treaty will expand markets for accessible products, technologies and decades of American expertise. Senator Bob Dole, among others, has been a strong supporter of the treaty, as a disabled veteran. "Now is the time to reaffirm the common goals of equality, access, and inclusion for Americans with disabilities—both when those affected are in the United States and outside of our country’s borders." It’s time that all people with disabilities, regardless of where they live in the world, are able to live with dignity, make their own choices and participate fully in society. It is time for the United States Senate to ratify the Disabilities Treaty.